These highlights do not include all the information needed to use NARATRIPTAN TABLETS safely and effectively. See full prescribing information for NARATRIPTAN TABLETS. Naratriptan is indicated for the acute treatment of migraine attacks with or without aura in adults. • Use only if a clear diagnosis of migraine has been established. If a patient has no response to the first migraine attack treated with naratriptan, reconsider the diagnosis of migraine before naratriptan is administered to treat any subsequent attacks. • Naratriptan is not indicated for the prevention of migraine attacks. • Safety and effectiveness of naratriptan have not been established for cluster headache. The recommended dose of naratriptan is 1 mg or 2.5 mg.
Naratriptan is contraindicated in patients with severe renal impairment (creatinine clearance: <15 mL/min) because of decreased clearance of the drug [see Contraindications (4), Use in Specific Populations (8.6), Clinical Pharmacology (12.3)]. In patients with mild to moderate renal impairment, the maximum daily dose should not exceed 2.5 mg over a 24-hour period and a 1 mg starting dose is recommended [see Use in Specific Populations (8.6), Clinical Pharmacology (12.3)]. Naratriptan is contraindicated in patients with severe hepatic impairment (Child-Pugh Grade C) because of decreased clearance [see Contraindications (4), Use in Specific Populations (8.7), Clinical Pharmacology (12.3)]. In patients with mild or moderate hepatic impairment (Child-Pugh Grade A or B), the maximum daily dose should not exceed 2.5 mg over a 24-hour period and a 1 mg starting dose is recommended [see Use in Specific Populations (8.7), Clinical Pharmacology (12.3)]. 1 mg white to off-white round, biconvex tablet debossed with â€œ54â€ on one side and â€œ227â€ on the other side. 2.5 mg white to off-white round, biconvex tablet debossed with â€œ54 351â€ on one side and plain on the other side. Naratriptan is contraindicated in patients with ischemic or vasospastic CAD. There have been rare reports of serious cardiac adverse reactions, including acute myocardial infarction, occurring within a few hours following administration of naratriptan. Some of these reactions occurred in patients without known CAD. Naratriptan may cause coronary artery vasospasm (Prinzmetalâ€™s angina), even in patients without a history of CAD. Perform a cardiovascular evaluation in triptan-naive patients who have multiple cardiovascular risk factors (e.g., increased age, diabetes, hypertension, smoking, obesity, strong family history of CAD) prior to receiving naratriptan. If there is evidence of CAD or coronary artery vasospasm, naratriptan is contraindicated. For patients with multiple cardiovascular risk factors who have a negative cardiovascular evaluation, consider administering the first dose of naratriptan in a medically supervised setting and performing an electrocardiogram (ECG) immediately following administration of naratriptan. For such patients, consider periodic cardiovascular evaluation in intermittent long-term users of naratriptan. Life-threatening disturbances of cardiac rhythm, including ventricular tachycardia and ventricular fibrillation leading to death, have been reported within a few hours following the administration of 5-HT1 agonists. Discontinue naratriptan if these disturbances occur. Naratriptan is contraindicated in patients with Wolff-Parkinson-White syndrome or arrhythmias associated with other cardiac accessory conduction pathway disorders. Sensations of tightness, pain, and pressure in the chest, throat, neck, and jaw commonly occur after treatment with naratriptan and are usually non-cardiac in origin. However, perform a cardiac evaluation if these patients are at high cardiac risk. 5-HT1 agonists, including naratriptan, are contraindicated in patients with CAD and those with Prinzmetalâ€™s variant angina. Cerebral hemorrhage, subarachnoid hemorrhage, and stroke have occurred in patients treated with 5-HT1 agonists, and some have resulted in fatalities. In a number of cases, it appears possible that the cerebrovascular events were primary, the 5-HT1 agonist having been administered in the incorrect belief that the symptoms experienced were a consequence of migraine when they were not. Also, patients with migraine may be at increased risk of certain cerebrovascular events (e.g., stroke, hemorrhage, TIA). Discontinue naratriptan if a cerebrovascular event occurs. Before treating headaches in patients not previously diagnosed as migraineurs, and in migraineurs who present with symptoms atypical for migraine, exclude other potentially serious neurological conditions. Naratriptan is contraindicated in patients with a history of stroke or TIA. Naratriptan may cause non-coronary vasospastic reactions, such as peripheral vascular ischemia, gastrointestinal vascular ischemia and infarction (presenting with abdominal pain and bloody diarrhea), splenic infarction, and Raynaudâ€™s syndrome. In patients who experience symptoms or signs suggestive of non-coronary vasospasm reaction following the use of any 5-HT1 agonist, rule out a vasospastic reaction before receiving additional doses of naratriptan. Serotonin syndrome may occur with naratriptan, particularly during co-administration with selective serotonin reuptake inhibitors (SSRIs), serotonin norepinephrine reuptake inhibitors (SNRIs), tricyclic antidepressants (TCAs), and monoamine oxidase (MAO) inhibitors [see Drug Interactions (7.3)]. Serotonin syndrome symptoms may include mental status changes (e.g., agitation, hallucinations, coma), autonomic instability (e.g., tachycardia, labile blood pressure, hyperthermia), neuromuscular aberrations (e.g., hyperreflexia, incoordination), and/or gastrointestinal symptoms (e.g., nausea, vomiting, diarrhea). The onset of symptoms usually occurs within minutes to hours of receiving a new or a greater dose of a serotonergic medication. Discontinue naratriptan if serotonin syndrome is suspected. Significant elevation in blood pressure, including hypertensive crisis with acute impairment of organ systems, has been reported on rare occasions in patients treated with 5-HT1 agonists, including patients without a history of hypertension. Monitor blood pressure in patients treated with naratriptan. Naratriptan is contraindicated in patients with uncontrolled hypertension. There have been reports of anaphylaxis and hypersensitivity reactions, including angioedema, in patients receiving naratriptan. Such reactions can be life threatening or fatal. In general, anaphylactic reactions to drugs are more likely to occur in individuals with a history of sensitivity to multiple allergens. Naratriptan is contraindicated in patients with a history of hypersensitivity reaction to naratriptan. Table 1 lists the adverse reactions that occurred in 5 placebo-controlled clinical trials of approximately 1,752 exposures to placebo and naratriptan in adult patients with migraine. Only reactions that occurred at a frequency of 2% or more in groups treated with naratriptan 2.5 mg and that occurred at a frequency greater than the placebo group in the 5 pooled trials are included in Table 1. Ergot-containing drugs have been reported to cause prolonged vasospastic reactions. Because these effects may be additive, use of ergotamine-containing or ergot-type medications (like dihydroergotamine or methysergide) and naratriptan within 24 hours of each other is contraindicated. Concomitant use of other 5-HT1B/1D agonists (including triptans) within 24 hours of treatment with naratriptan is contraindicated because the risk of vasospastic reactions may be additive. There are no adequate data on the developmental risk associated with use of naratriptan in pregnant women. Data from a prospective pregnancy exposure registry and epidemiological studies of pregnant women have documented outcomes in women exposed to naratriptan during pregnancy; however, due to small sample sizes, no definitive conclusions can be drawn regarding the risk of birth defects following exposure to naratriptan [see Data]. In animal studies, naratriptan produced developmental toxicity (including embryolethality and fetal abnormalities) when administered to pregnant rats and rabbits. The lowest doses producing evidence of developmental toxicity in animals were associated with plasma exposures 2.5 (rabbit) to 11 (rat) times that in humans at the maximum recommended daily dose (MRDD) [see Data]. Human Data: The numbers of exposed pregnancy outcomes accumulated during the Sumatriptan/Naratriptan/Treximet® (sumatriptan and naproxen sodium) Pregnancy Registry, a population-based international prospective study that collected data from October 1997 to September 2012, and smaller observational studies, were insufficient to define a level of risk for naratriptan in pregnant women. The Registry documented outcomes of 57 infants and fetuses exposed to naratriptan during pregnancy (52 exposed during the first trimester and 5 exposed during the second trimester). The occurrence of major birth defects (excluding fetal deaths and induced abortions without reported defects and all spontaneous pregnancy losses) during first-trimester exposure to naratriptan was 2.2% (1/46 [95% CI: 0.1% to 13.0%]) and during any trimester of exposure was 2.0% (1/51 [95% CI: 0.1% to 11.8%]). Seven infants were exposed to both naratriptan and sumatriptan in utero, and one of these infants with first-trimester exposure was born with a major birth defect (ventricular septal defect). The sample size in this study had 80% power to detect at least a 3.8-to 4.6-fold increase in the rate of major malformations. The developmental and health benefits of breastfeeding should be considered along with the motherâ€™s clinical need for naratriptan and any potential adverse effects on the breastfed infant from naratriptan or from the underlying maternal condition. Safety and effectiveness in pediatric patients have not been established. Therefore, naratriptan is not recommended for use in patients younger than 18 years of age. One controlled clinical trial evaluated naratriptan (0.25 to 2.5 mg) in 300 adolescent migraineurs aged 12 to 17 years who received at least 1 dose of naratriptan for an acute migraine. In this study, 54% of the patients were female and 89% were Caucasian. There were no statistically significant differences between any of the treatment groups. The headache response rates at 4 hours (n) were 65% (n=74), 67% (n=78), and 64% (n=70) for placebo, 1-mg, and 2.5-mg groups, respectively. This trial did not establish the efficacy of naratriptan compared with placebo in the treatment of migraine in adolescents. Adverse reactions observed in this clinical trial were similar in nature to those reported in clinical trials in adults. Clinical trials of naratriptan did not include sufficient numbers of patients aged 65 and older to determine whether they respond differently from younger patients. Other reported clinical experience has not identified differences in responses between the elderly and younger patients. In general, dose selection for an elderly patient should be cautious, usually starting at the low end of the dosing range, reflecting the greater frequency of decreased hepatic, renal, or cardiac function and of concomitant disease or other drug therapy. A cardiovascular evaluation is recommended for geriatric patients who have other cardiovascular risk factors (e.g., diabetes, hypertension, smoking, obesity, strong family history of CAD) prior to receiving naratriptan [see Warnings and Precautions (5.1)]. The use of naratriptan is contraindicated in patients with severe renal impairment (creatinine clearance: <15 mL/min) because of decreased clearance of the drug. In patients with mild to moderate renal impairment, the recommended starting dose is 1 mg, and the maximum daily dose should not exceed 2.5 mg over a 24-hour period [see Dosage and Administration (2.2), Clinical Pharmacology (12.3)]. The use of naratriptan is contraindicated in patients with severe hepatic impairment (Child-Pugh Grade C) because of decreased clearance. In patients with mild or moderate hepatic impairment (Child-Pugh Grade A or B), the recommended starting dose is 1 mg, and the maximum daily dose should not exceed 2.5 mg over a 24-hour period [see Dosage and Administration (2.3), Clinical Pharmacology (12.3)]. The elimination half-life of naratriptan is about 6 hours [see Clinical Pharmacology (12.3)], and therefore monitoring of patients after overdose with naratriptan should continue for at least 24 hours or while symptoms or signs persist. There is no specific antidote to naratriptan. It is unknown what effect hemodialysis or peritoneal dialysis has on the serum concentrations of naratriptan. The empirical formula is C17H25N3O2SHCl, representing a molecular weight of 371.93. Naratriptan hydrochloride USP is a white to pale yellow crystalline powder that is readily soluble in water. Each naratriptan tablet for oral administration contains 1.11 or 2.78 mg of naratriptan hydrochloride USP, equivalent to 1 or 2.5 mg of naratriptan, respectively. Each tablet also contains the inactive ingredients: colloidal silicon dioxide, croscarmellose sodium, lactose (anhydrous), magnesium stearate, and microcrystalline cellulose. Naratriptan binds with high affinity to 5-HT1B/1D receptors. Migraines are likely due to local cranial vasodilatation and/or to the release of sensory neuropeptides (including substance P and calcitonin gene-related peptide) through nerve endings in the trigeminal system. The therapeutic activity of naratriptan for the treatment of migraine headache is thought to be due to the agonist effects at the 5-HT1B/1D receptors on intracranial blood vessels (including the arterio-venous anastomoses) and sensory nerves of the trigeminal system, which result in cranial vessel constriction and inhibition of pro-inflammatory neuropeptide release. Renal Impairment: Clearance of naratriptan was reduced by 50% in subjects with moderate renal impairment (creatinine clearance: 18 to 39 mL/min) compared with the normal group. Decrease in clearances resulted in an increase of mean half-life from 6 hours (healthy) to 11 hours (range: 7 to 20 hours). The mean Cmax increased by approximately 40%. The effects of severe renal impairment (creatinine clearance: â‰¤15 mL/min) on the pharmacokinetics of naratriptan have not been assessed [see Contraindications (4)]. In carcinogenicity studies, mice and rats were given naratriptan by oral gavage for 104 weeks. There was no evidence of an increase in tumors related to naratriptan administration in mice receiving up to 200 mg/kg/day. That dose was associated with a plasma (AUC) exposure that was 110 times the exposure in humans receiving the MRDD of 5 mg. Two rat studies were conducted, one using a standard diet and the other a nitrite-supplemented diet (naratriptan can be nitrosated in vitro to form a mutagenic product that has been detected in the stomachs of rats fed a high nitrite diet). Doses of 5, 20, and 90 mg/kg were associated with AUC exposures that in the standard-diet study were 7, 40, and 236 times, respectively, and in the nitrite-supplemented-diet study were 7, 29, and 180 times, respectively, the exposure in humans at the MRDD. In both studies, there was an increase in the incidence of thyroid follicular hyperplasia in high-dose males and females and in thyroid follicular adenomas in high-dose males. In the standard-diet study only, there was also an increase in the incidence of benign c-cell adenomas in the thyroid of high-dose males and females. The exposures achieved at the no-effect dose for thyroid tumors were 40 (standard diet) and 29 (nitrite-supplemented diet) times the exposure achieved in humans at the MRDD. In the nitrite-supplemented diet study only, the incidence of benign lymphocytic thymoma was increased in all treated groups of females. It was not determined if the nitrosated product is systemically absorbed. However, no changes were seen in the stomachs of rats in that study. The efficacy of naratriptan in the acute treatment of migraine headaches was evaluated in 3 randomized, double-blind, placebo-controlled trials in adult patients (Trials 1, 2, 3). These trials enrolled adult patients who were predominantly female (86%) and Caucasian (96%) with a mean age of 41 years (range: 18 to 65 years). In all studies, patients were instructed to treat at least 1 moderate to severe headache. Headache response, defined as a reduction in headache severity from moderate or severe pain to mild or no pain, was assessed up to 4 hours after dosing. Associated symptoms such as nausea, vomiting, photophobia, and phonophobia were also assessed. Maintenance of response was assessed for up to 24 hours postdose. A second dose of naratriptan or other rescue medication to treat migraines was allowed 4 to 24 hours after the initial treatment for recurrent headache. In all 3 trials, the percentage of patients achieving headache response 4 hours after treatment, the primary outcome measure, was significantly greater among patients receiving naratriptan compared with those who received placebo. In all trials, response to 2.5 mg was numerically greater than response to 1 mg and in the largest of the 3 trials, there was a statistically significant greater percentage of patients with headache response at 4 hours in the 2.5-mg group compared with the 1-mg group. The results are summarized in Table 2. 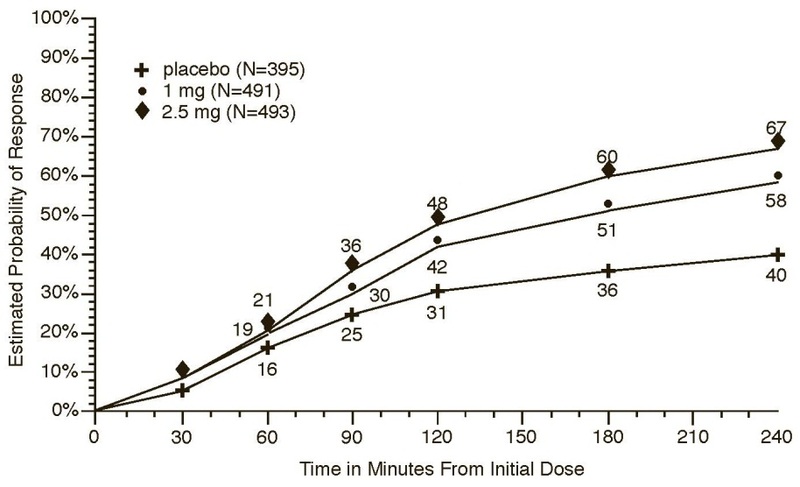 • P<0.05 compared with placebo. • P<0.05 compared with 1 mg.
• a The figure shows the probability over time of obtaining headache response (reduction in headache severity from moderate or severe pain to no or mild pain) following treatment with naratriptan. In this Kaplan-Meier plot, patients not achieving response within 240 minutes were censored at 240 minutes. For patients with migraine-associated nausea, photophobia, and phonophobia at baseline, there was a lower incidence of these symptoms 4 hours following administration of 1-mg and 2.5-mg naratriptan compared with placebo. • a Kaplan-Meier plot based on data obtained in the 3 controlled clinical trials (Trials 1, 2, and 3) providing evidence of efficacy with patients not using additional treatments censored at 24 hours. 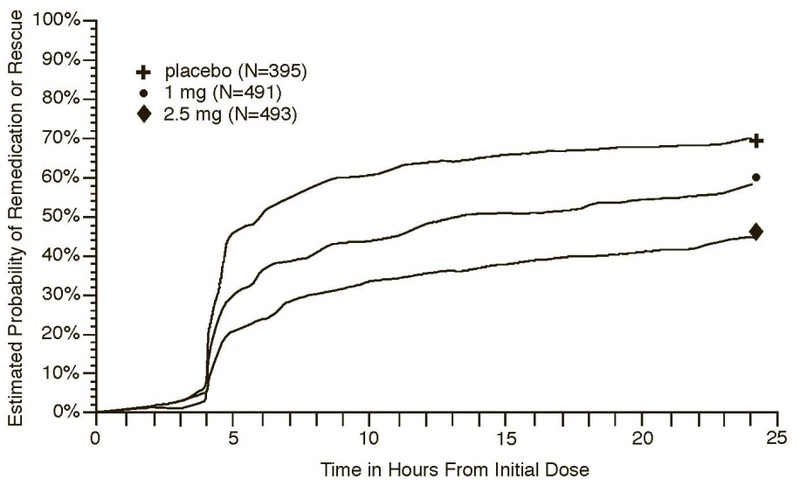 The plot also includes patients who had no response to the initial dose. Remedication was discouraged prior to 4 hours postdose. There is no evidence that doses of 5 mg provided a greater effect than 2.5 mg. There was no evidence to suggest that treatment with naratriptan was associated with an increase in the severity or frequency of migraine attacks. The efficacy of naratriptan was unaffected by presence of aura; gender, age, or weight of the subject; oral contraceptive use; or concomitant use of common migraine prophylactic drugs (e.g., beta-blockers, calcium channel blockers, tricyclic antidepressants). There was insufficient data to assess the impact of race on efficacy. 1 mg tablets are supplied as white to off-white round, biconvex tablets debossed with â€œ54â€ on one side and â€œ227â€ on the other side. 2.5 mg tablets are supplied as white to off-white round, biconvex tablets debossed with â€œ54 351â€ on one side and plain on the other side. Inform patients that naratriptan may cause serious cardiovascular side effects such as myocardial infarction or stroke. Although serious cardiovascular events can occur without warning symptoms, patients should be alert for the signs and symptoms of chest pain, shortness of breath, irregular heartbeat, significant rise in blood pressure, weakness, and slurring of speech and should ask for medical advice if any indicative sign or symptoms are observed. Apprise patients of the importance of this follow-up [see Warnings and Precautions (5.1, 5.2, 5.4, 5.5, 5.8)]. Inform patients that anaphylactic reactions have occurred in patients receiving naratriptan. Such reactions can be life threatening or fatal. In general, anaphylactic reactions to drugs are more likely to occur in individuals with a history of sensitivity to multiple allergens [see Contraindications (4), Warnings and Precautions (5.9)]. Inform patients that use of naratriptan within 24 hours of another triptan or an ergot-type medication (including dihydroergotamine or methysergide) is contraindicated [see Contraindications (4), Drug Interactions (7.1, 7.2)]. Caution patients about the risk of serotonin syndrome with the use of naratriptan or other triptans, particularly during combined use with SSRIs, SNRIs, TCAs, and MAO inhibitors [see Warnings and Precautions (5.7), Drug Interactions (7.3)]. Treatment with naratriptan may cause somnolence and dizziness; instruct patients to evaluate their ability to perform complex tasks after administration of naratriptan. Read this Patient Information before you start taking naratriptan tablets and each time you get a refill. There may be new information. This information does not take the place of talking with your healthcare provider about your medical condition or treatment. Naratriptan is a prescription medicine used to treat acute migraine headaches with or without aura in adults who have been diagnosed with migraine headaches. Naratriptan is not used to prevent or decrease the number of migraine headaches you have. Naratriptan is not used to treat other types of headaches such as hemiplegic migraines (that make you unable to move on one side of your body) or basilar migraines (rare form of migraine with aura). It is not known if naratriptan is safe and effective to treat cluster headaches. It is not known if naratriptan is safe and effective in children under 18 years of age. Who should not take naratriptan? • hemiplegic migraines or basilar migraines. If you are not sure if you have these types of migraines, ask your healthcare provider. • an allergy to naratriptan or any of the ingredients in naratriptan tablets. See the end of this leaflet for a complete list of ingredients in naratriptan tablets. What should I tell my healthcare provider before taking naratriptan? • are breastfeeding or plan to breastfeed. It is not known if naratriptan passes into your breast milk. Talk with your healthcare provider about the best way to feed your baby if you take naratriptan. Using naratriptan with certain other medicines can affect each other, causing serious side effects. How should I take naratriptan? • Certain people should take their first dose of naratriptan in their healthcare providerâ€™s office or in another medical setting. Ask your healthcare provider if you should take your first dose in a medical setting. • Take naratriptan exactly as your healthcare provider tells you to take it. • Your healthcare provider may change your dose. Do not change your dose without first talking with your healthcare provider. • Take naratriptan with water or other liquids. • If you do not get any relief after your first naratriptan tablet, do not take a second tablet without first talking with your healthcare provider. • If your headache comes back or you only get some relief from your headache, you can take a second tablet 4 hours after the first tablet. • Do not take more than a total of 5 mg of naratriptan in a 24-hour period. • Some people who take too many naratriptan tablets may have worse headaches (medication overuse headache). If your headaches get worse, your healthcare provider may decide to stop your treatment with naratriptan. • If you take too much naratriptan, call your healthcare provider or go to the nearest hospital emergency room right away. • You should write down when you have headaches and when you take naratriptan so you can talk with your healthcare provider about how naratriptan is working for you. What should I avoid while taking naratriptan? • medication overuse headaches. Some people who use too many naratriptan tablets may have worse headaches (medication overuse headache). If your headaches get worse, your healthcare provider may decide to stop your treatment with naratriptan. These are not all the possible side effects of naratriptan. For more information, ask your healthcare provider or pharmacist. How should I store naratriptan? General information about the safe and effective use of naratriptan. Medicines are sometimes prescribed for purposes other than those listed in Patient Information leaflets. Do not use naratriptan for a condition for which it was not prescribed. Do not give naratriptan to other people, even if they have the same symptoms you have. It may harm them. This Patient Information leaflet summarizes the most important information about naratriptan. If you would like more information, talk with your healthcare provider. You can ask your healthcare provider or pharmacist for information about naratriptan that is written for healthcare professionals. For more information call 1-800-962-8364. What are the ingredients in naratriptan? Inactive ingredients: colloidal silicon dioxide, croscarmellose sodium, lactose (anhydrous), magnesium stearate and microcrystalline cellulose. The brands listed are registered trademarks of their respective owners.